The Third Place Books close to us was having a blowout on used books a couple of weeks ago, and we picked up a copy of The Best of Cooking Light: Everyday Favorites for four bucks (I’m a sucker for cookbooks with pictures). This pork posole recipe caught my eye because it looked pretty much like a normal (aka, non-light) posole recipe. Pork is browned and then added to a stock made from chicken broth and pureed ancho chilies. This recipe is all about the condiments: a squeeze of lime and a bunch of cilantro really brings out the flavors in this soup. 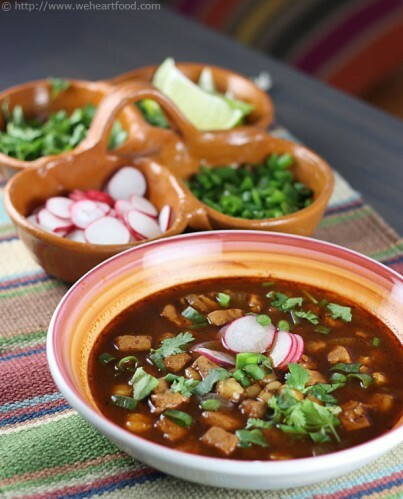 We must love posole — I think we have four different recipes on the site. Yep, and each one is a little different. I’m not sure about this one, you know I like the stewier ones. Well, even though this one is broth-based, I think you’ll like it. What? Ahhh… hit it with those garnishes. Squeeze that lime! Add those onions! Savor the cilantro! Wow, that makes a big difference… yum! It’s definitely growing on me. Awesome — I’m going back for more. Heat a cast-iron skillet over high heat. Place chilies in pan; flatten with a spatula. Cook 10 seconds on each side or until blackened. Combine toasted chilies and 2 cups boiling water in a bowl; let stand 10 minutes or until soft. Place pepper mixture in a blender; process until smooth. Cook cumin seeds in a large Dutch oven over medium heat for 1 minute or until toasted and fragrant. Place in a spice or coffee grinder; process until finely ground. Heat oil in Dutch oven over medium-high heat. Add pork; cook 5 minutes, browning on all sides. Do this in batches if you must — don’t crowd the pork or it’ll steam instead of brown. Remove pork from pan. Reduce heat to medium. Add onion and garlic to pan; cook 8 minutes or until onion is browned, stirring frequently. Stir in pork, pureed chilies, toasted ground cumin, broth, sugar, salt, and hominy; bring to a simmer. Cook 30 minutes or until pork is tender. Spoon equal portions posole into each of 6 bowls; top each serving with radishes, green onions, and cilantro. Serve with lime slices. This entry was posted on Tuesday, July 14th, 2009 at 9:29 pm	and is filed under Cooking Light, Main Dishes, Mexican, Soups and Stews. You can follow any responses to this entry through the RSS 2.0 feed. You can leave a response, or trackback from your own site.